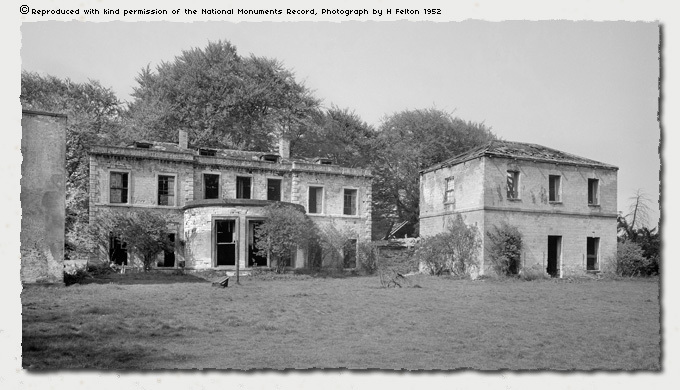 A wider angle view from the 1952 shots by Herbert Felton, the Hall is in three distinct parts by this time, all the northern side of the property having been removed in earlier demolitions. In the centre is the main core of the house with the bay window of the Dining Room either side of this are, to the right the Small Drawing Room and to the left Mrs Gascoigne's Room Descriptions from the 1885 Plan by G Fowler Jones. 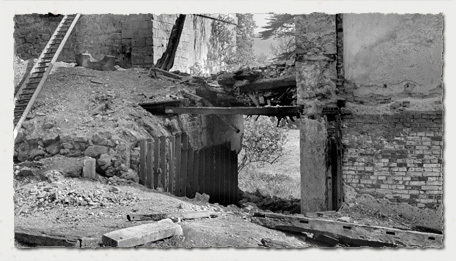 The block on the extreme right is the Drawing Room and just on the extreme left is the West Wing, the structure still standing to this day. [In fact where I am writing this copy, now]. Each of the three parts shown in the picture represent a different era, the centre piece was built in the early 18th century by Sir Edward Gascoigne, the structure on the right is probably Sir Thomas Gascoigne or Richard Oliver Gascoigne. it is a simpler design and lacks the embelishments of the earlier structure. 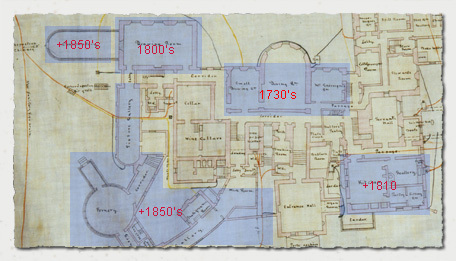 The West Wing on the left is probably much older than both the other sections. Clearly it was not built as a statement of the wealth and position of the owner. It was most likely a purely functional part of the house, therefore it was not considered when new plans were considered for the Presentational part of the house. It just continued to be there, doing service to the daily activities of the hall, used for guest purposes on the first floor and on the ground floor, a series of utility rooms and servants quarters. It is ironic that the West Wing is all that remains today, it is not even a listed building. 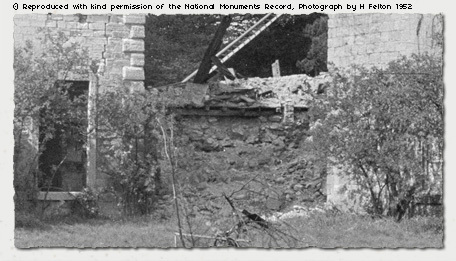 With walls over three feet thick it was perhaps part of an earlier building, which preceded the structures on its east flank. 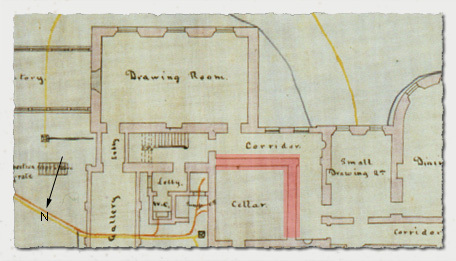 The rubble in the gap between the Drawing Room and the Dining Room Block shown in the image above is the wall of the wine cellar [See the red highlight on the plan below], spilling down into the area that was the corridor connecting the older Dining Room section to the later Drawing Room. Whereas at the time of the plan  the cellar was wholly internal to the building, the walls themselves were part of an earlier external structure, being built in faced stone on the outward south facing elevations. The next image shows the return of the cellar wall highlighted in red on the plan, the view is from the other side of the hall looking south. This wall has been cloaked with a timber stud framework, presumably done when it ceased to be an external wall and was part of the corridor connecting the Dining Room Block and the Drawing Room. The Dining Room extension is attributed to Sir Edward Gascoigne, references to it are made in his diaries of the time [1730's]. The Drawing Room and Kitchen [Bottom Right] are believed to be either Sir Thomas Gascoigne or Richard Oliver Gascoigne. The Conservatory [Attached to the Drawing Room] probably later, perhaps along with the Picture Gallery, Fernery and Photographic Studio, attributable to the daughters of Richard Oliver Gascoigne, Isabella and Elizabeth Gascoigne post 1850's. The wine cellar which was made up of three rooms was contained in part by the corridor leading from the Small Drawing Room to the Main Drawing Room. The floor of the cellar was at the level of the ground floor of the hall, the ladder in the picture above is lying across the vaulted roof of the cellar, this roof was at an intermediate level, halfway between the ground floor and the first floor. This suggests the cellar was not built in any conformity with the surrounding structures, therefore probably a much earlier section of the Hall.